Chicago Children's Museum is to improve children’s lives by creating a small society for children to play and learn. Chicago Children’s Museum is a place where families and children are encouraged to create, explore, and discover together through play. We focus on literacy, science, math, arts, and health. Some of Chicago Children's Museum's most popular exhibits include: Dinosaur Expedition(恐龙之旅), where kids can dig for dinosaur bones; WaterWays(水道探险), it shows the wonders of water; Kids Town, where children buy and sell in shops, build their own city; Play It Safe（小小消防员）, a firehouse and fire truck that invites families to learn about fire safety through play. Chicago Children's Museum (CCM) is a not-for-profit cultural center. Located on Navy Pier(海军码头) since 1995, Chicago Children's Museum is now one of the city's top cultural attractions and the second most visited children's museum in the country. 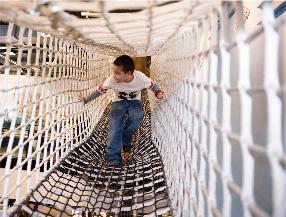 Chicago Children's Museum serves more than 657,000 visitors per year throughout Chicago. 1. What’s the purpose of Chicago Children's Museum? C To improve children’s lives. D To help parents look after kids. 2. Which of the following can children find in Chicago Children's Museum? 3. Where should you go if you want to learn something about fire? 4. Which of following can you use in WaterWays? B A spader (铁锹) . 5. Who is most interested in Chicago Children's Museum? A Students in high school.